You need to be observant to recognise any changes in your dog's behaviour. 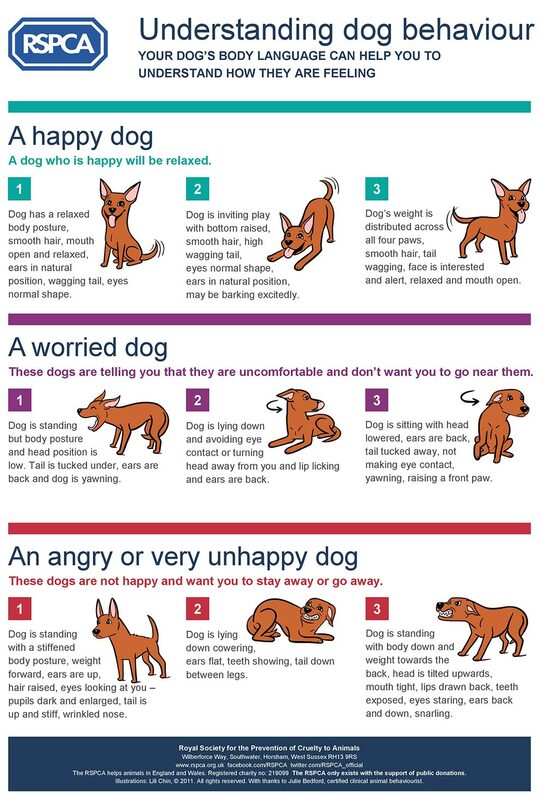 Use this guide to help you recognise important body language signals and get to know how your dog is feeling. If you're concerned about your dog's behaviour speak to your vet first who may then refer you to a clinical animal behaviourist. View the dog behaviour infographic. 1. Dog has a relaxed body posture, smooth hair, mouth open and relaxed, ears in natural position, wagging tail, eyes normal shape. 2. Dog is inviting play with bottom raised, smooth hair, high wagging tail, eyes normal shape, ears in natural position, may be barking excitedly. 3. Dog's weight is distributed across all four paws, smooth hair, tail wagging, face is interested and alert, relaxed and open mouth. These dogs are telling you that they're uncomfortable and don't want you to go near them. 1. Dog is standing but body posture and head position is low. Tail is tucked under, ears are back and dog is yawning. 2. Dog is lying down and avoiding eye contact or turning head away from you and lip licking and ears are back. 3. Dog is sitting with head lowered, ears are back, tail tucked away, not making eye contact, yawning, raising a front paw. These dogs aren't happy and want you to stay away or go away. 1. Dog is standing with a stiffened body posture, weight forward, ears are up, hair raised, eyes looking at you ¿ pupils dark and enlarged, tail is up and stiff, wrinkled nose. 2. Dog is lying down cowering, ears flat, teeth showing, tail down between legs. 3. Dog is standing with body down and weight towards the back, head is tilted upwards, mouth tight, lips drawn back, teeth exposed, eyes staring, ears back and down, snarling. Embed RSPCA Understanding Dog Behaviour on your site!